Darth Vader stood in front of the rectangular window. Bleak raindrops trickled down the glass with monotonous persistence. Outside, small lonely aircraft were barely visible through the impenetrable mist; only sporadically glowing red lights sent hopeful signals to the observers as the plane was making its predictable course. The air was fresh in an unpleasant, nearly sterile way, devoid of any discernible smells, threatening to tear the lungs with its frigid indifference. “Yes, Master,” Darth Vader replied without turning his head. The Emperor had just entered the room, moving softly, with deceptive humility, like a lean old cat ready to hunt once more for good old times’ sake. He floated towards the tall masked man, his scarred face evoking pity alongside revulsion, a regular old ugly Grandpa strolling out in the night. He put his bony hand on his disciple’s shoulder, and they stood like that for a while, a master and his student, bound by too many contradicting emotions and too much pain, their own and that of others. “It’s your son,” the Emperor said quietly, pursing his lips and nodding, as if he was precipitating a complaint and eager to show his compassion and understanding. “I know, Master,” Darth Vader spoke in the same even tone, like an antique droid with a damaged emotive simulator. The Emperor looked at him almost imploringly. Darth Vader turned to him for the first time. A shiny, plastic-like, scary black mask covered his face entirely, and his voice sounded as cold as ever, coming through artificial chords. Darth Vader chuckled. It was horrifying to hear that clacking, metallic sound coming out of his chest, while his face remained permanently immobile. The Emperor was slightly taken aback by this outburst. His large, innocent blue eyes were gazing at his apprentice attentively. He arched his back and looked at his disciple defiantly, his eyes emitting almost mischievous sparkles. He kept looking at Darth Vader, merry little fires dancing in his calm, intelligent eyes. His good mood was coming back. Darth Vader made a strange sound. It was impossible to say whether he was laughing or crying. The Emperor nodded several times, looking serious and collected, as if he was accepting the challenge and thinking hard about what to say next. When he spoke, his voice was soft and kindly; he was almost hugging his pupil, creating an air of friendly intimacy as the sky outside darkened more and more. The Emperor stared at him with nearly comical disbelief. And after that one word was uttered, the conversation ceased abruptly, as if someone sealed it tightly and forever. They both stood silently, looking out of the window, where the last planes were on their farewell routine patrol. The rain had stopped, but the drops of water were still lazily crawling down the panes, bright and crystal clear, like the tears of an angel. The Emperor and Darth Vader were sharing a strange closeness, a bizarre bond one last time, and their foreboding silence was telling more than any of them would ever be able to express. “Tomorrow,” the Emperor said finally. “I can't keep it up any longer,” Fjul stated, disconnecting his bio-psycho-receptor from the boy’s head. “Why? What happened?” Jack Lewis asked hurriedly. Fjul let the receptor dry out in the feeble rays of the planet's small sun, visibly enjoying the process. Both of his pan-sensory organs were lightly pulsating, consuming the floating essence distributed by local plants. “Nothing, I’m just tired,” the alien explained. “Hey, I’m right here,” Fjul said pointedly, stretching out and grabbing a beautiful purple alien fruit from a nearby tree. Jack shook his head several times, as if he was refusing to believe what was happening. “The Bible is more important than any science,” Virginia declared, pursing her lips. Jack looked at her with nearly comical despair in his eyes. She left the forest clearing, looking attractively neat and determined in her tweed skirt. Harmony started briskly walking off in the opposite direction. “Come on, Eli,” she said again. He squatted in front of the boy and ruffled his hair affectionately. Jack thought about that for a moment. “Kid’s got a point,” he said. Once it is pity and desire; once pity and revulsion: yet pity is always, or at least often, there. Agreeably. Line 2 of Paragraph 1 says "Outside, small lonely aircraft were. . ." did you miss a letter? aircrafts* and it is confusing at "plane" in that same line and paragraph. A very unique take on Star Wars and I have to say it is brilliant. What an absolutely divine way of teaching some principles! Once again you impress me my newfound friend! Yes, the dialog is what I liked best about it... I think that you made your point very well, & you're right about aircraft being the proper way to say it... (Prior comment from somebody else) You did an awesome job of making your point here, & it speaks to the Star Wars fan, as well as the idealist in me! Also, it doesn't feel unfinished to me... Just saying! Thank you very much for your kind and continuous support, Spyguy! Now I feel more determined to keep developing this sub-setting of my universe (the planet Toliman, which is also the stage for my story "Murder in Sapphington" and featuring heroes first introduced in "Ichthys"). I think a further story dealing in detail with the local inhabitants' unique ability to connect to the minds of others is coming up! Thank you so much for your kind comment! Always appreciate your feedback! Uplifting. An easy read packing a lot of meaning. I am a firm believer that happy endings are more challenging than most of us realize. A happy ending can easily descend into soggy, Disney territory. There is nothing wrong with that per se, but I don't know too many authors who would like terms like "soggy and Disney-like" attributed to their endings. You have nothing to fear. I think this story is a prime example of how to approach an uplifting/happy ending. Well done, I enjoyed it and hope to read the "Murder" sequel. As a star wars fan (and Vader fan in particular), I have a minor question/suggestion, why does Vader say "Yes, sir" instead of his usual "Yes, Master"? Did I miss something? 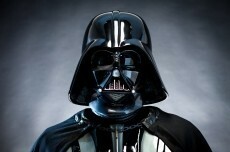 If you ever retouch the story, you may want to think about the latter (for those of us too used to Vader's mannerisms). Thank you very much for your insightful comment! I'm so glad you liked this story. Indeed, this is one of my few stories with a relatively bright, optimistic ending - they are awfully hard to do. "Murder in Sapphington" is just one of the sequels to this one - "The End of the World" is a more fitting continuation on a global scale. I'll change the "Sir" to "Master"! Thanks for pointing that out! MUCH BETTER than the last story of yours I read. The exchange between Vader and the Emperor felt as if Lucas himself had wrote it. Hell, you write better than Lucas. Thank you for the undeserved compliment, Richard :-) I'm glad you liked this one. Moral questions pop into my head again. Another incredibly well written piece. There's a bigger story forming and I think I need to find the time to read them all in order. I find it interesting that an alien would teach the bible, it'll be interesting to see If that can be abused. The bad thing was that I couldn't see the Emperor's conversation taking place but that was sorted out with the explanation in the second part with the people. Thank you so much, Lucas! This story is not very popular, and I used to doubt it because it has very little actual plot. I basically wrote down the outlines of the Christian thought concerning justice, retribution, and salvation through love, and then I thought that Darth Vader could serve as an example for the way it works. Then the actual story of the discovery of the alien race Nsheo was added to it as a way to connect it to the interconnected world of my stories. This one is the "origin story" of the Proxima Centauri (Nsheo) arc, it continues in "The Last of the Nsheos" and "The End of the World". You've read about Jack Lewis going to that planet in the prologue to "Idols". Jack Lewis also appears in "Eternity", and I plan to dedicate an origin story to his life on Earth. Yes Star Wars fan here. Alright so to start its an amazing fan fiction scene for episode VII. Well written and a good ending to it. This could be a secret portion of Star Wars Episode 6! Even though I am not much of a philosophical person, I really do like the conversation between Darth Sidious and Vader in this one. The way Sidious manipulated Anakin is pretty much akin to how negative impacts or people in life can affect anyone. Great job as always, Oleg!